You’ve stepped up your game in more ways than one, like treating your family to dinner, capping off the team’s successful project at work, and getting to spend long weekends at the beach with friends. You’re on your way to your prime, and it’s definitely out with the old and in with the new this time around. Go ahead and make sure everything else is up to speed with that renewed energy of yours. 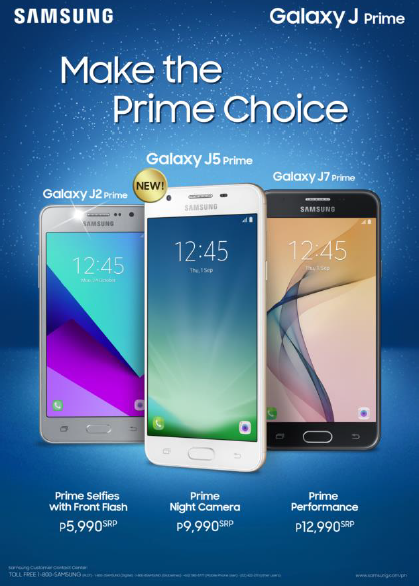 And while you’re at it, why not get that prime smartphone experience that’s especially suited for you? Level up with the latest in the Samsung Galaxy J Prime Series. Make the most out of every milestone and have the freedom to take your pick from the Galaxy J Prime Series line-up, for an upgrade that’s just right for you. First up, there’s the Galaxy J2 Prime which guarantees prime selfies thanks to its 8MP camera with front flash, giving you the freedom to share more of your life. Priced at P5,990 SRP, the Galaxy J2 Prime is perfect for those who want to experience what it means to level up their lives. Boosting the Samsung’s J Prime Series is the brand’s latest local addition – the new Galaxy J5 Prime equipped with a prime night camera all thanks to its 13MP rear camera with an F/1.9 aperture that lets you take great photos even in low light conditions. The Galaxy J5 Prime lets you capture memorable moments of all your activities, including nighttime get-togethers with friends. Its 13MP rear camera is complemented with its 5MP front camera with an F/2.2 MP aperture to make sure the selfies you take are always Instagram-worthy. Ever stylish, its metal design comes with a durable screen made of 2.5D Gorilla Glass 4 to fit the changing demands of your lifestyle. Coupled with its 5.0 HD TFT display, you’re sure to enjoy everything you see on screen – whether it’s your friends’ uploads on Facebook, or the video games that you love to play during your “me time”. Available in gold and black, the Galaxy J5 Prime goes well with any lifestyle and with anywhere your plans may take you – whether it’s to the office, the mall, or your favorite hangout spot with friends. Running on a Quad Core 1.4 GHz system, with over 2GB RAM and 16GB ROM memory that’s expandable up to 256GB, you’ll have the space you need to capture and store those notable moments that you encounter in your everyday adventures. With a 2600mAH battery, you’re sure that it can keep up with you all throughout your day. The Galaxy J5 Prime is available at P9,990 SRP. If you’re up for a prime performance, then the Galaxy J7 Prime is the one for you. With its large internal memory of over 3GB RAM and 32GB ROM, you can stock up on photos, videos, apps, and games – giving you the freedom to make the most out of your smartphone. At P12,990 SRP, the Galaxy J7 Prime is a great steal for that premium upgrade. Choose to level up with the Galaxy J Prime smartphone that’s right for you. Take prime selfies with the Galaxy J2 Prime, take beautiful photos even at night with the prime night camera of the Galaxy J5 Prime, or jump up to your prime performance with the Galaxy J7 Prime. Visit Samsung Experience Stores or authorized Samsung dealers nationwide to meet your match for this season’s upgrade.